Vizualtech has been a more of a retro kinda car designer. 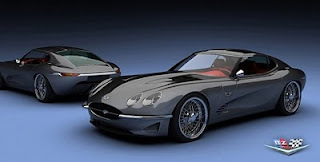 Robert Palm, and Bo Zolland aer Swedish designer's that have come up with a new retro version of the XKR, but taken it back 50 years to the Growler E. With enough people interested in this vehicle, they will be putting a 5.0 liter supercharged V8 putting out and astonishing 600hp!! This car looks so great, James Bond should be getting one of these in the mail soon. And with a price-tag between $700,000 and $1.4 million, its right up Bonds ally. Limited production will be in affect as expected. Four head lights and an oval mouth keep the Jaguar styling fresh but still carrying heritage.